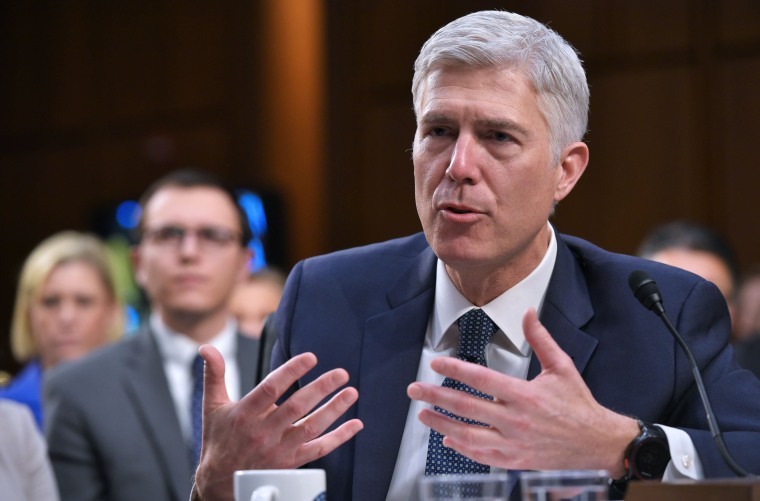 Facing significant Democratic opposition, Republicans on Thursday enacted the "nuclear option" to clear the way to confirm Neil Gorsuch as President Donald Trump's nominee to the Supreme Court. That confirmation vote is expected on Friday. Here we take a look at the nuclear option — what it is, how it works, its history and where the name comes from. What is “the nuclear option”? The “nuclear option” is a last-resort, break-in-case-of-emergency way for the majority party in the Senate to overcome obstruction by the minority. All it actually involves is changing the rules of the Senate so that a nominee like Gorsuch can be confirmed with a simple majority of 51 votes. Under the previous rules, 60 votes were needed to foil any attempt by the minority party to block a vote by use of the filibuster. While senators are no longer required to give actual speeches to mount a filibuster, it has remained powerful tool that allows the minority to gum up action in the Senate until the majority can find 60 votes to break a logjam. The change to a simple majority vote may not sound very dramatic, but in a place like the Senate, which operates on tradition and bipartisan comity, it’s a big deal befitting its apocalyptic name. Former GOP Senate Majority leader Trent Lott coined the term because both parties saw it as an unthinkable final recourse, just like nuclear war. During a standoff over George W. Bush nominees in 2003, Republicans discussed invoking the parliamentary move by using the codeword “The Hulk" since it, like the superhero alter ego, cannot be controlled once it is unleashed. Senators have threatened to go nuclear for decades. In 1957, then-Vice President Richard Nixon wrote an advisory opinion that helped lay the groundwork for the procedural move. But no one pushed the proverbial button until 2013, when then-Majority Leader Harry Reid invoked the nuclear option to lower the 60-vote threshold to 51 for approval of Executive Branch appointees (such as Cabinet secretaries) and federal judges below the Supreme Court (such as for U.S. Courts of Appeal). Reid justified the move by citing unprecedented obstruction from Senate Republicans, but members of both parties lamented the precedent it set. Last week, Sen. Chuck Schumer, who took over for Reid as leader of Senate Democrats, said he regrets going nuclear four years ago. Of course, Schumer could just be saying that now that he’s in the minority, since there are plenty of clips of Reid and McConnell opposing the nuclear option before they supported it. Going nuclear means that future presidents of either party will have a much easier time getting their Supreme Court nominees confirmed, which could change whom they decide to appoint. Instead of choosing a more moderate judge who could win support from both parties, they could pick a more ideological jurist capable of winning only on a party-line vote, since the threshold will move from 60 to 51 votes. James Madison wrote in the federalist papers that the Senate was “the great anchor of the Government,” whose slower processes and higher thresholds for action would guard against the “fickleness and passion" of public opinion. That anchor just got a lot lighter.